The original release of the Sony PlayStation was over 20 years ago now. This is a console that ushered in a new era of games and changing the way of gaming forever more. The PlayStation brought us a new era of games with 3D graphics and CD-ROM discs. Developed by Sony the very first brand was introduced in 1994 in Japan. We are now up to the PS4 console and we also have a media centre, an online service, a full line of controllers, two handhelds, and multiple magazines. The original PlayStation was the first video game console to sell over 100 million units. The PlayStation 2 was released in 2000 and is the best-selling home console to date. The PlayStation 2 was backwards compatible and could play all the original PlayStation games. A slimline version of the PS2 was released in 2004 and included an Ethernet port. The PlayStation 3 was released in 2006 and was the first console in the series to introduce the use of motion sensing technology through its Sixaxis wireless controller. It also incorporated a Blu-ray players and features high-definition resolution. The PS3 came with 20GB or 60GB but this increased in increments up to 500GB. A slimline model was released in 2009, with a super slim model being released in 2012. The super slim model was a new console with a completely redesigned case with a sliding door covering the disc drive. It came with 12GB flash memory or a 250GB, 500GB hard drive. The latest release by Sony, the PlayStation 4 sold 1 million consoles in its first 24 hours on sale making it the fastest selling console in history. This was released in the third quarter of 2013 and is the eight-generation system. It introduced the x86 architecture. Sonly also introduced the PlayStation App which allows PS4 users to turn smartphones and tablets into a second screen to enhance gameplay. This includes popular games like NBA 2k for PS. PlayStation Now was also released which is a game streaming service. A share button was included on the new controller that makes it possible to view in-game content being streamed live from friends. Sony also released a handheld game console range with the PSP followed by the PS Vita in 2011. PlayStation's use DualShock controllers which is a line of vibration-feedback gamepad. The PlayStation Network is an online service that comprises of the PlayStation Store where players can purchase and download games and other forms of multimedia. There is also a subscription based online service called PlayStation Plus and a social gaming network called PlayStation Home. PlayStation Mobile provides content on mobile devices. PlayStation has released some amazing games over the years and many of these were exclusive to their console. Below is a list of the top 20 games in PlayStation History. Other titles that deserve a mention include; ICO, Flower, InFamous, SOCOM, TimeSplitters, Final Fantasy X, Final Fantasy XII, Metal Gear Solid 3: Snake Eater, Vagrant Story, Parappa the Rapper, and Oddworld: Abe's Oddysee. PlayStation is changing how we play games online. With the release of the PS4 we have seen an increase in social gaming. The new Share Play feature lets you sample a friend's game or hand the controller to a friend over the internet. Games such as Far Cry 4 even allows players to play co-op for free with a friend who doesn't own the game. It is a massive success and we are sure to see more games following suit. There are some major exclusives planned for 2016 including "Uncharted 4" and "The Last Guardian". Sony is also planning to launch its first virtual reality headset for the PS4 in 2016. This headset is going to cost as much as a new gaming platform and this could be a bit of a let-down for fans until the PlayStation VR builds up its library with must have games or decides to drop the price a bit. 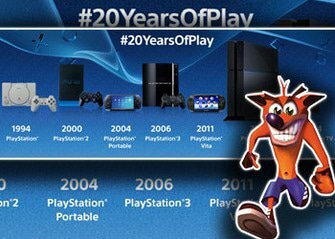 One thing we can be sure of; PlayStation has been around for 20 years with great success and we expect that success to continue for many more years to come.